“The third night seems very long. I stand beside her many hours, holding her hand. I wonder how long my stamina can last. In the middle of loss comes awareness – of gratitude, for the gifts of what was, for the strength and beauty of what is, for trust in the continuity of what is to come. Returning to the present and the more recent death of our neighbor, Yoshi, I wonder, did he know it was coming? Or did it creep up on him in the night and usher him quietly from the unconscious state of sleep into the deeper realms of death? And this leads to another question, one I carry with me: How do I live life now so that I’m aware of and ready for death when it comes? what luminous ones midwife you beyond? This entry was posted in Chinese Medicine, Death and Dying, Qigong, Qigong and Chinese Medicine, Uncategorized and tagged Chi and Creativity, Kaleo Ching, Microcosmic Orbit, North Atlantic Books, Qigong, The Creative Art of Living Dying and Renewal on October 27, 2014 by eliseching. Three police vehicles are parked outside our neighbor’s apartment. What’s happening? From the dark entryway, a young police officer emerges, pink-cheeked, smooth-faced, neat as a cadet in his starched uniform. He could be my grandson if I’d worked young and hard at starting a family rather than devouring books and writing poetry. He enters his car and gets on the radio. There’s no urgency in his manner. He speaks so quietly that all I hear is the radio’s static. 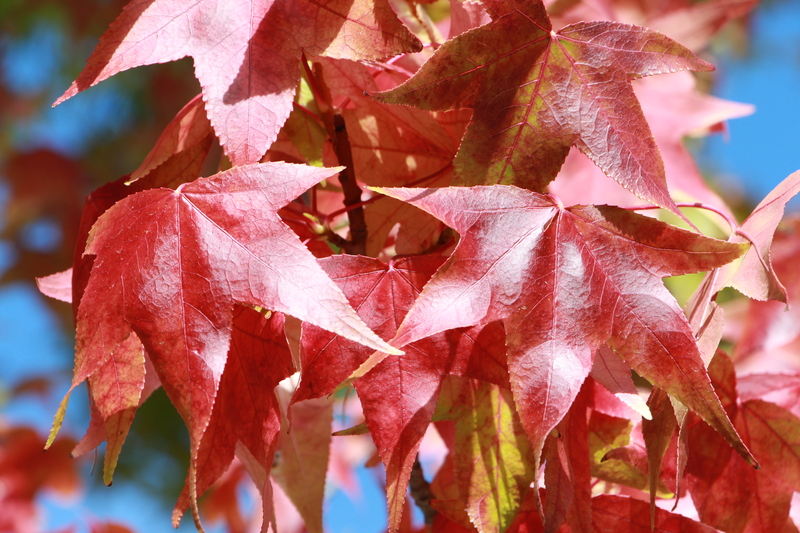 The nearby Japanese maple’s autumn-bitten leaves curl like fists, glow dark as venous blood. Wind gusts and leaves tremble and drop, bowing to the season of letting go. A “Cremation and Funeral Services” vehicle arrives. Two middle-aged men climb out, dressed neatly, conservatively. They wheel a gurney into the apartment. What I’m witnessing is standard procedure for someone who dies at home, alone. My thoughts are leaves. They swirl around, fly up, alert the heavens, here comes Yoshi, until they are squelched by the honking and flapping of Canada geese circling above in a feint of southerly migration. Other neighbors gather on the sidewalk, talk about Yoshi’s health, his cryptic references to elevated enzyme levels, how he seemed to have lost weight. Last time I saw him across the driveway, our Australian shepherd, Kahu, tugged me over for a face-to-face hello. Kahu loved a good squirm around “Uncle Yoshi’s” legs. Yoshi seemed subdued, maybe even sad. Now I watch as his body, sealed in a white bag, then draped in an elegant deep-sea-green velvet blanket, is wheeled out of its familiar home and into the chamber of the van. I say a goodbye prayer – aloha Ke Akua mau loa, go with eternal Divine love. That evening as Kaleo and I sit in our usual half-hour meditation, I continue my prayers for Yoshi’s passage, to the radiant light, to the embrace of his Japanese ancestors, who, I am sure, are there to welcome him. As I sense the spirit world hovering close to the threshold of my consciousness, I feel my Column of Light expanding to the walls of our meditation room then contracting to wrap me in its shimmering boundary of Qi (p. 96). Using my hands like siphons, I gather the energies of Earth, Environment, and Heaven then offer them in the Qi Blessing (p. 229) to encourage Yoshi’s spirit safely on its journey. 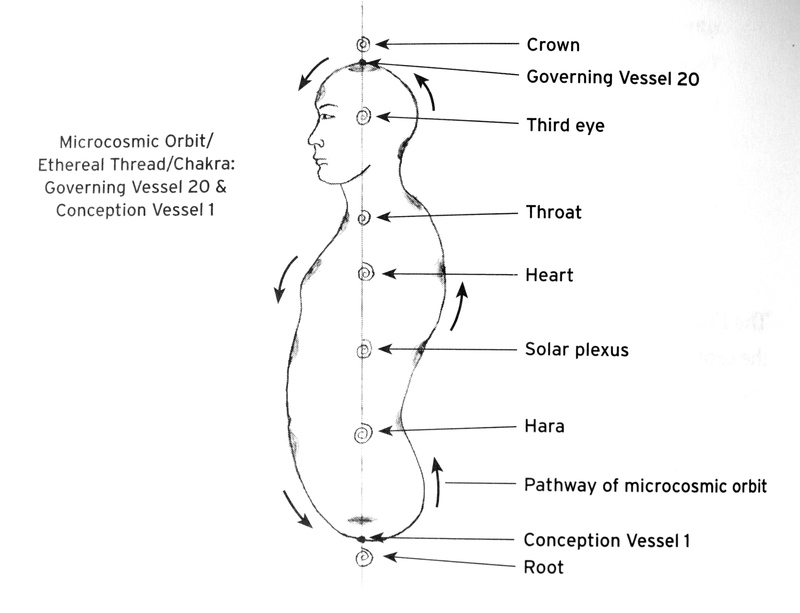 I feel the Qi flowing strongly in the Microcosmic Orbit of my body (p. 172). It flows from the energy center of my lower Dan Tian, down the center of the front of my torso, up the center of my back, over my crown, and back down the front, bridging where my tongue nestles against the roof of my mouth. Its flow is like being gently plugged in and lit up – plugged into the energies of Heaven and Earth and lit up by their interaction with my own bio-electric current of Qi. I am grateful for the support of this ancient Qigong meditation. 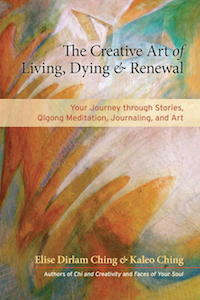 This entry was posted in Chinese Medicine, Death and Dying, Qigong, Qigong and Chinese Medicine, Uncategorized and tagged Chi and Creativity, Kaleo Ching, North Atlantic Books, The Creative Art of Living Dying and Renewal on October 20, 2014 by eliseching.